Admittedly, my daily miu miu is large, and able to contain the reading and observation material that I need 24/7, but it still looks like a handbag. These, however aren't handbags. 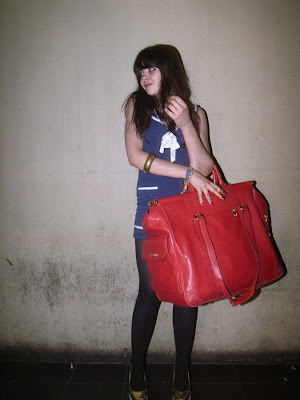 As I Hate Generic puts it, this girl looks like she's from Lilliput and made off with a pochette from Brobdingnag. If that is considered suitable for a night out clubbing, what do these ladies do when travelling? Book a whole Boeing for their luggage? Posted by la femme at 11:53 a.m.
oooh that looks like a painful schelp.... perhaps she's spending the night at a friends house? i'm not organzied enough to have a bag that size function... panic attacks occur each time my phone rings! Wow, you could smuggle a baby in there! Hell, you could smuggle twin babies in there. Although if you are carrying around two babies in your purse I may have to call the authorities. o my lord! I already get asked by my boyfriend's parents if I'm going on a trip carrying around my bag that barely fits my powerbook. I can't imagine one that size. When I saw this on FaceHunter I burst out laughing. Its so typical of something Yvan would photograph, but really, what was this girl thinking? She's either serious and then this is ridiculous or then maybe she's just being ironic and making fun of the big bag trend.